Capt. Moe Neale and Capt. 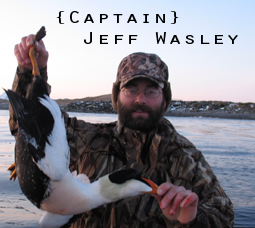 Jeff Wasley are teaming up to provide safe, ethical and productive hunts for the highly prized King Eider. 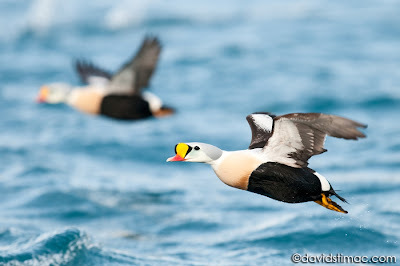 Alaskan Eider Outfitters will provide the best opportunity for a guided King Eider hunt. With 3 guides with over 30 years of waterfowl hunting and guiding experience in Alaska we are able to consistently provide safe and productive hunts for our King Eider hunts. All of our guides are lifelong waterfowlers with extensive experience hunting sea ducks and more in Alaska and beyond. We will be using huge spreads of custom decoys to bring them in close for our hunters. Our Coast Guard licensed captains will keep you safe in our 17' TDB Sea Class boat and in our rugged Zodiac. All of our boats will have required safety gear and 2 motors to ensure we do not get stranded. The Bering Sea can be very dangerous location to hunt and we will not take any unnecessary risks. What we will do is give our best effort everyday to help you get your birds. The weather on the Bering Sea is infamous for being very windy and cold during our hunts. We feel that through careful preparation we can ensure our hunter have the best opportunities for a successful hunt. Hunters can expect to be treated to some great food during their stay with us at St. Paul. Our lodging includes a dining area, spacious rooms, lounge area, hot showers, laundry, TV, and more to make your experience in Alaska a great one. We will start each day with a hot breakfast and then gear up for a hunt on the Bering Sea. Depending on weather conditions we will take the boats out or hunt from land if the weather is to rough for boating. We will typically come back for a hot lunch and then back out for more duck hunting. After the afternoon hunt our guest can look forward to warming up back at the lodge and to a great dinner prepared by our cook. With the short days of January we will have amble time in the evenings to talk about duck hunting, Alaska and the ducks we all appreciate so much. We look forward to hunting with our new and old friends in the last frontier. St. Paul has more than just duck hunting and we are happy to give tours of the community that includes a busy commercial fishing port, Russian Orthodox Church, US Coast Guard Station and more. The island is also home to a variety of marine life as well as fox and reindeer. More info for our hunts can be found on the Alaskan Eider Outfitters homepage. Hunting for Eiders in Alaska is the pinnacle experience of waterfowling in North America. Alaskan Eider Outfitters knows that these trophies do not come easy, but we have the experience and the locations for you to get your true trophies of a lifetime. King Eiders are extraordinary ducks that inhabit harsh yet beautiful areas of the far north. 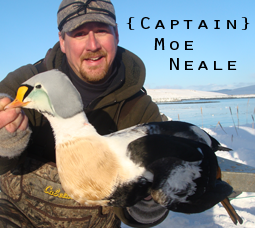 Join us to hunt King Eiders in Alaska’s Pribilof Islands in the famous Bering Sea.